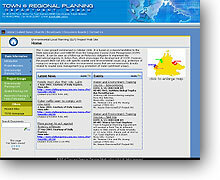 This web site was developed for the ELP project under the Town and Regional Planning Department (TRPD). This site was more comprehensive that TRPD, in that more application was built for use. I have set up a web server box to run on IIS with Microsoft SharePoint Team Services (STS) support. This enables developers to develop any kind of application on the fly. Apps such as a document library for file sharing, surveys and polls, events calendar, discussion boards, and much more. STS requires the use of MS FrontPage 2002. Tools & skills used: HTML, Microsoft FrontPage, Adobe Photoshop, Microsoft SharePoint Team Services, MSDE (Microsoft Database Engine), Cascading Style Sheet (CSS), basic XML, Internet Information Server (IIS) 5.0, Windows 2KPro / XP Pro.